Sterling Silver St. Sebastian / Baseball Pendant, SN Heavy Curb Chain, Large Size Catholic Medal, 1" x 3/4"
Engraving is available for large and medium medals only. 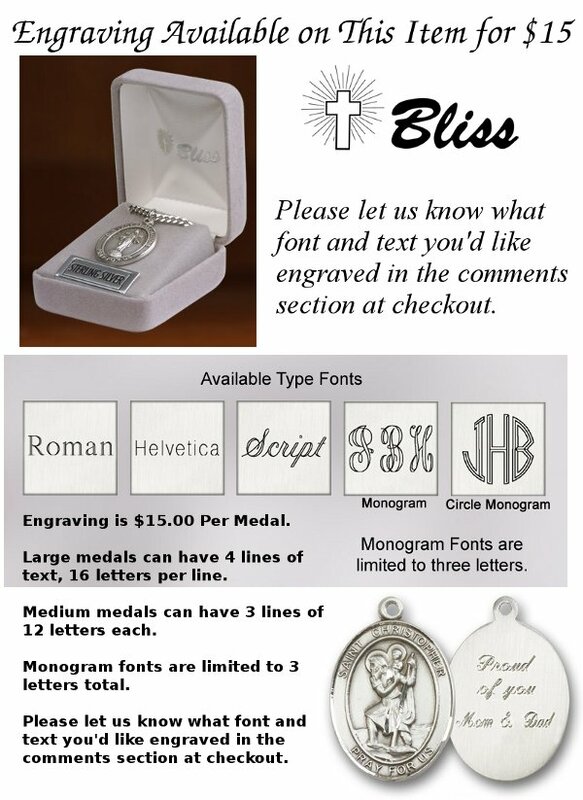 Engraving is available up to 4 lines 16 Letters each on the large medals and up to 3 lines 12 Letters each on medium medals. Available Type Fonts: Roman, Helvetica, Script, Mongram, & Monogram Circle. Monogram Fonts are limited to three letters. Add words to be engraved at checkout in comments box. Bliss Manufacturing, a more than 100-year-old, family-owned company, makes all of its jewelry in the U.S.A. They currently offer more than 450 different Patron Saint medals. All Bliss jewelry is die-struck, the same way the U.S. Mint makes coins, which produces rich detail. Each Bliss medal carries a Lifetime Warranty. If for whatever reason a Bliss medal shall become tarnished, Bliss will either re-finish or replace the medal free of charge. Gold Filled St. Sebastian / Baseball Pendant, GF Lite Curb Chain, Medium Size Catholic Medal, 3/4" x 1/2" St. Sebastian Pendant and Prayer Card Set PSD600SB 14 KT Gold St. Sebastian/Baseball Medal, Medium Size Catholic Medal, 3/4" x 1/2" Gold Filled St. Sebastian/Baseball Pendant, GF Lite Curb Chain, Small Size Catholic Medal, 1/2" x 1/4"
14 KT Gold St. Sebastian/Baseball Medal, Small Size Catholic Medal, 1/2" x 1/4" Sterling Silver St. Sebastian/Baseball Pendant, Sterling Silver Lite Curb Chain, Medium Size Catholic Medal, 3/4" x 1/2" 14 KT Gold St. Sebastian / Baseball Medal, Large Size Catholic Medal, 1" x 3/4" 14 KT Gold St. Sebastian/Baseball Medal, Large Size Catholic Medal, 1" x 3/4"